Posted December 7th, 2017 by David Firth & filed under Emerging Technologies, Self driving vehicles. 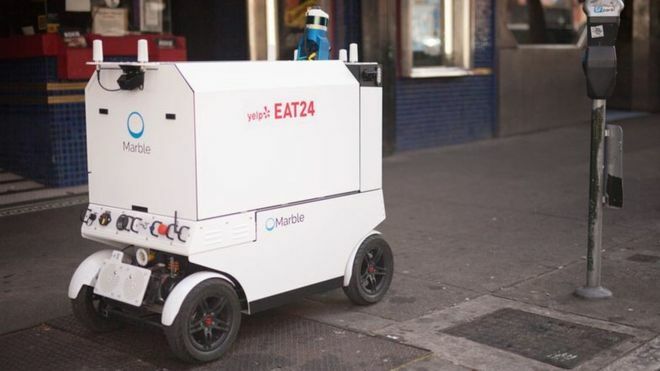 San Francisco officials have voted to restrict where delivery robots can go in the city, in a blow for the burgeoning industry. Start-ups will have to get permits to use such bots, which will be restricted to less crowded urban areas. Opponents are concerned about the safety of pedestrians, particularly elderly people and children. Walk San Francisco, a group that campaigns for pedestrian safety, wanted a complete ban. 1) The issue here seems to be focused on “public safety”. Do you agree or not whether this is the main issue? 2) Should this self-driving technology be allowed on sidewalks?